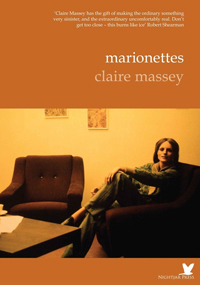 CLAIRE MASSEY LIVES IN LANCASHIRE. Her short stories have been published online and in print in various magazines and anthologies including The Best British Short Stories 2011, Patricide and A cappella Zoo. Two of her stories have recently been published as chapbooks by Nightjar Press. She co-edits online short story magazine paraxis and keeps a blog called Gathering Scraps. In her story ‘In the Dressing Room Mirror’ a young woman is afraid to face her own reflection. I live in an old Lancashire mill town and I grew up in another one. The landscape, which I love, has a massive impact on my work, which features lots of crumbling terraces, hills and abandoned buildings. Rain tends to permeate my stories. On the settee in my living room, in an old brown chair in my bedroom, on my bathroom floor or in the bath, or in the kitchen whilst I’m cooking tea. I spend a lot of time on trains but I prefer to use that time for daydreaming. Reading. Being read stories and being taken to the theatre as a child, and never being able to give up on the idea of playing in imaginary worlds. Writers who inspire me and who make me want to give up in equal measure include: Jorge Luis Borges, Italo Calvino, Bruno Schulz, Daphne du Maurier, Leonora Carrington, Angela Carter, M John Harrison, David Constantine, Nicholas Royle and Joel Lane. 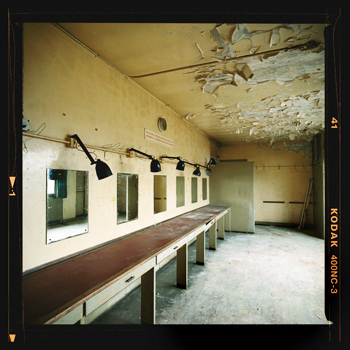 It was the mirrors, the peeling paper on the ceiling and the dust on the tables. I love abandoned places, and the way the often mundane or random things that get left behind seem to brim with meaning in an abandoned setting. Have you worked with artists before and if so, how was the experience? No, and I’ve really enjoyed it. It was intriguing and challenging to use someone else’s creative work in this way. It made me take off from a completely different place as a writer. My stories always grow from an image, either something I’ve seen in the street or something that appears in my thoughts without me necessarily being able to trace where it’s come from, but I’ve never started from a photograph before. Yes, I love it. I enjoy reading novels, too, but there’s something so powerful about the world that can be created in a smaller space. As a reader, I treasure short stories. I never devour collections but give each story space to linger in my mind. As a writer, short stories are an infuriating and joyful challenge. I’ll never tire of trying, and often failing, to write the stories I imagine. I’ve just finished a couple of commissions so I’m taking a breath before starting on the research and imagining for a collection of short stories in which I want to explore the history of neuroscience and some of the peculiarities of the human mind, looking particularly at perception, memory and imagination. I’m also just starting work on a graphic novel set in an alternative Edinburgh with my sister. Why did you start paraxis – an online magazine of short stories? I’d set up and run one online magazine already (New Fairy Tales) and I really enjoyed the thrill of seeking out stories and of creating something new by putting together work from writers and artists across the world. Publishing online doesn’t give you the tactile pleasure of publishing print books (which I’ve also been lucky enough to do through my job at Litfest), but the unbelievably wide reach of the internet really appeals to me. Paraxis was born of a frustration of mine and my co-founding editor Andy Hedgecock’s with the way literary and genre fiction is so often divided up. We just wanted to publish imaginative, well-written short stories without considering labels. Two of your stories were recently published as individual chapbooks by Nicholas Royle’s Nightjar Press. How did this come about? I won a competition that Nick judged a couple of years ago with a story about a drowned village. We’ve kept in touch ever since and he’s been a brilliant mentor, editor and friend. I’ve collected all of the Nightjars. I love the quality of the chapbooks, both in their haunting content and the beautiful design, and I desperately wanted to have a Nightjar of my own. I was very nervous when I sent Nick the stories that became my Nightjars, and thrilled when he accepted them for publication.